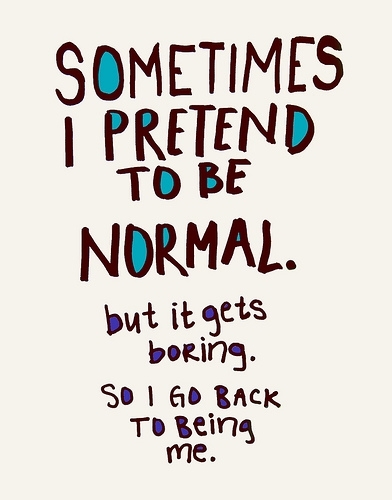 So I Guess That I Am Not Normal | Live. Learn. Love. Eat. Most of the time I feel pretty normal. In my home, homeschooling, doing yoga, cooking and baking all of our food from scratch and living a vegan lifestyle seems normal. Then there are those awkward times when we go somewhere or people come over and I realize that we really are different. When we go to town and people ask why Autumn isn’t in school that particular day or when we go anywhere that food is served and we don’t eat with people. When I go to the girls dance recital and I am the only woman with not a drop of make-up on my face. When people talk about a new T.V show or commercial, toy or celebrity and I and my family have no clue what they are talking about. In these moments I realize that I am different and the life that I and my family live is not what most people would consider normal. I was thinking about this last night and came up with a list of all the things we don’t do and a second list of what I/we do that makes us misfits in this society. have showers (we only have old fashioned tubs, so we bathe) My kids are scared to death of showers. I am sure that there are more things that I just can’t think of right now. I used to think that not fitting in was bad or wrong. It sure does feel awkward when you realize that you are not normal but it is not necessarily a bad thing. I have learned to follow my intuition, think for myself and do what I know in my heart to be right. I want my life to reflect my values and who I really am. I don’t feel happy when I am just trying to be like everybody else. Maybe it works for most people, but for me and my hubby, it just doesn’t. We would rather be ourselves and raise our kids being our abnormal selves, then pretending to be something we aren’t, living a lie and being completely miserable because of it. So being different is OK. Being yourself is what is truly important and what will bring you happiness. Only you know what is right for you and your family. Listen to that voice inside that is your true self and follow it. Do what feels right to you. When you let yourself be you, you let your light shine in this world, which unconsciously gives others permission to be themselves and shine their light too. I know that sounds cheesy, but it is true! If you take a look around, it is apparent that we could use a whole hell of a lot more light these days. Normal is just normal. Normal is conformity, the usual, expected, average, typical and ordinary. Abnormal may not be conformity or any of those other things, but who ever decided non-conformity was a bad thing? I will end with this picture I found on pinterest that I often make my desktop wallpaper. It’s always nice coming across people that feel the same way I do. I currently work for an insurance company and I’m always feeling like I’m the odd person out. Don’t get me wrong, I get along with just about everyone but I always feel there is no one on “my page”, so to speak. I’m not into religion, politics, eating toxic food, obsessing about sports, this TV show or that show etc. I’m more into kung-fu, tai chi/meditation, surfing, hiking, making music, writing, being a clown, and looking for alternatives to our current way of relying on money to survive. Everyone picks their nose but nobody admits to it. S and I are both a little homophobic and are seriously considering the possibility of homeschooling our future kids, mainly for that reason. That is not normal.. lol! Everyone has their oddities, but it is those of us that admit to it that are the most special indeed. Your lifestyle is unique and works well for your family, I admire how consistent you are in sticking to it. I think that you are pretty normal. I wish that more people in this world could be like you, maybe this world will be a better place. It’s good that you teach your kids to be kind to other people because theirs not enough of that in the world today and that frustrates me. I don’t perm my hair anymore or my daughter’s hair and we sometimes get negative reactions from people who think everybody is supposed to be like them. I have to listen to my daughter tell me all the time about how the girls in her high school class talk about her and treat her wrong and don’t realize or try to find out what a really nice person she is and that really makes me sad. Theirs a few really nice kids in her school too, but very few. It’s really refreshing that their are still people in this world that are good people. After all what you learn at home is how you react to other people.